These .avi videos were kindly done by Matthew Hare, the semi co-producer of this site. Thanks Matthew! Perhaps we will put some more up later... perhaps. There is also one Real Media file of the Art Institute scene now. 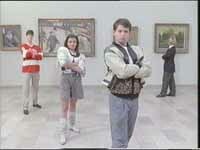 Description : Join Ferris, Cameron & Sloane as they tour the Art Institute of Chicago. Description : Ferris explains the do's and don'ts of faking out your parents in order to get the day off school. Description : After all the credits have rolled by, Ferris confronts the audience in his corridor to tell them that the movie is over. Description : Jeanie aka Shona says goodbye to "Garth" (Charlie Sheen's character) at the police station, and goes a little ga-ga. Description : Jeanie and Ed Rooney scare each other in the Bueller house thinking that the other one is Bueller. Jeanie freaks out kicks Rooney and runs away screaming in a hillarious scene. Description : Jeanie answers the door, expecting the police to come to her rescue, but is instead greeted with a "unique" singing get well telegram for Ferris. Description : The famous Ben Stein "Bueller, Bueller, Bueller" roll call scene that was voted one of the top 50 recognisable scenes in US film history (I believe). Also includes Kristy Swanson as Simone, explaining Ferris' absence. Description : Cameron, Ferris and Sloane go to the top of the Sears Tower and lean their heads upon the glass for a dizzying effect.